A multibillion dollar industry that consists of Dyes, Pigments and Intermediates. In Global Dyestuff industry, an impressive growth has been seen over the years. This industry includes three sub-segments namely Dyes, Pigments, and Intermediates. The dye intermediates are essential derivatives of petroleum products which after further processing gets transformed into finished dyes and pigments. In 2005, the global market size for dyes, pigments and intermediaries was estimated at around $23 billion. If we see the total volume, then global dyestuff production is estimated to be somewhere around 34 million tonnes. 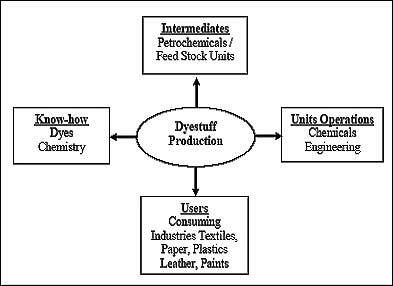 The annual global sales of textile dyestuff alone is estimated approximately around $ 6 billion. One of the major factors that had emerged within the last few years is that the major production centres for dyestuff has shifted from the west to the east. The global dye manufacturing industry originally dominated by suppliers from Europe namely UK, Switzerland Germany, has shifted to Asia over the past 20 years or so. This is primarily because of two reasons. First, due to much lower costs of production in the Asia region. Secondly Asia's growing prominence as the hub for global textile industry. The markets for the dyes are predominantly dominated by reactive and disperse dyes. In fact the demand for these two dyes is expected to grow in future also. Nations like China, South Korea and Taiwan are strong players in the field of disperse dyes. Interestingly, India has taken lead in production of reactive dyes because of the availability of an intermediate called vinyl sulphone in the country. 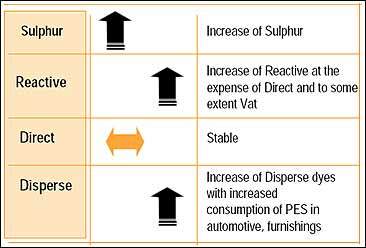 The following diagram illustrates the expected trends of some of the prominent dyes. China's share in the world market is estimated to be around 25%. Along with China, Taiwan, India, Japan and Pakistan are among the major dyestuff producing countries in the industry. But in terms of the sheer volume of market share, Europe is the leading. This is due because of its allegiance towards specialty products. The global market share of Indian dyes industry is between 5 - 7%, and it is continuously increasing year by year. Environmental Considerations- The thrust is now towards the environment friendly natural dyes. The industry can only prosper if the dyes are not hazardous and environment friendly. A very good example is the banning of the Azo dyes in Europe along with closure of the units. Support of the Government and Trade Association- Any industry that moves ahead needs the back-end support of the government as well as the trade associations. This helps to promote that industry in other countries, allocation of investments and giving other supports. These associations should actively promote technology institutes that does research activities. Problem of over capacity but falling margins- It is a fact that China and India now have high potential as regards production capacity is concerned. This is due to a shift in the manufacturing bases from Europe and some other industrialise nations. But there is varying demand across these regions and that is the cause for volatility in the market. Thus affecting prices. Fierce competition- Again, because of the shift of companies from West to East has resulted in concentration of all the companies in the Asian region which has created intense competition in the global market. Research & Development- Market demands a higher spending for innovation in products like natural dyes. Product quality vis-a-vis competitive prices- Manufacturers should focus on the quality of products along with competitive prices for retaining market. The production share of the developed countries in the market has gone down from 65% to around 50% and this is further expected to reduce in future. Classification of products and services- A decline in the growth for products has prompted the manufacturers to move to specialty products. High cost of energy and interest- The exorbitant cost of interest can lower the investment in R&D which is at the core of product and service innovations. Also, the high energy cost has also adversely impacted the manufacturing units. Availability of World Class Infrastructure- As ports and roads are the primary sources of transport, the Governments must emphasis to improve the clearance of the goods at a quicker rate to facilitate trade.